Fry the red onion in the oil, and once softened add the garlic and fry for one minute more. Add the mince to the pan, turn up the heat and cook until browned through. Drain any fat in the pan away and add the mince and onion mixture to the slow cooker. Chop the carrots and mushrooms and add them to the pot. Add the tin of chopped tomatoes, rich beef stock pot or beef stock cube, tomato puree and cook on high for 4-5 hours. When there is approx 2 hours left, make the mash. Simmer the potatoes for approx 20 mins until softened, then add the milk and butter and mash with a potato masher. Spoon the mash on top of the filling in the slow cooker pot. Cook for the rest of the time remaining. 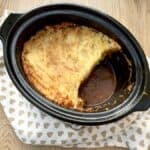 Preheat your grill and put the slow cooker pot in a roasting tray, then put it under the grill for 20 minutes to brown the top of the cottage pie. Warning: only do this if you have a sear and stew type slow cooker with a metal pot, or a pot which the instructions say can be used under the grill, or, if you are a bit reckless like me, an old slow cooker pot that you don't mind losing if it cracks.